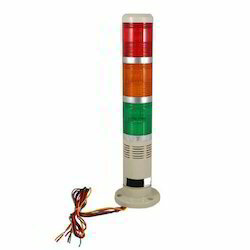 Prominent & Leading Manufacturer from Nashik, we offer tower lamp. We are the leading organization in the industry to provide our clients the best quality array of Tower Lamp. The offered lamp is used as CNC machines status indicator, textile machines, production plants, automatic machines, audio visual indicators. This lamp is manufactured under the strict supervision of adept technocrats using premium grade components as well pioneered techniques. The provided lamp is precisely checked by quality auditors on predefined parameters of quality in order to ensure its high performance. Ideal For audio - Visual alarm.